GBCO Spanish School, is a family-run school located in Calpe, in Alicante province. Students live with their Spanish teachers ” Javier and Ana ” and their family. This is ideal for adults and families looking for something different : A real Spanish experience with the teachers at your disposal around the clock , and amazing food and setting! Our Spanish immersion homestay is based on active learning and daily participation. Living with us, your Spanish teachers, and our family, you keep improving your Spanish skills both inside and outside the classroom. –Experience Spanish Life as part of a warm, friendly family, based at our home in Calpe! Homestay gives you the opportunity to learn Spanish intensively, rapidly and successfully. You will be speaking Spanish every day and your Teacher, and all the GBCO staff, will be encouraging and helping you to find the best ways of saying what YOU want to for day-today conversation. Whatever your level of Spanish, our courses are specifically designed to meet your individual needs. We start every Monday and at all levels. This course is designed for people who would like to perfect their Spanish knowledge and get maximum results in minimum time but having free time in the afternoons. That is why this program it is ideal as Intensive Spanish Course for Adults in Spain. Every day, the course starts with grammatical concepts, vocabulary, writing and phonetics in the first two hours, with a short break to rest or have a little breakfast. 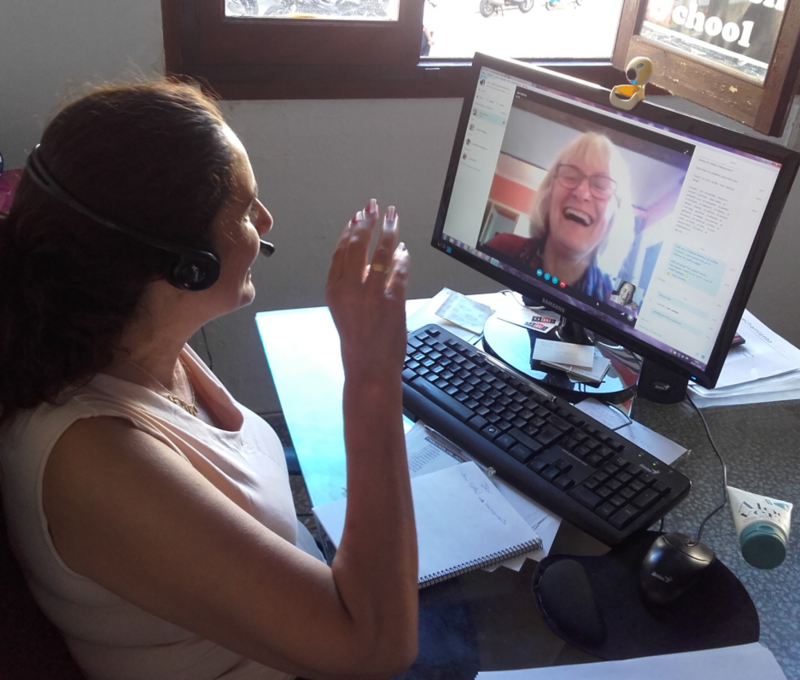 In the last two hours, we continue with conversation sessions, integrating activities and tasks such as: telephone conversations, public presentations on various topics, practice for buying…etc. HOW MUCH AND HOW LONG ARE THE COURSES? All the prices at our website are per week. However, students can book the number of weeks they wish. A deposit of 150€ should be paid on reserving a course (not for indididual lessons and Spanish program for residents). The course fee is payable in full no less than four weeks before the start date of the course. We reserve the right to cancel any course that has not been paid. The deposit fee (150€) will not be refund in any case. 100% of the total amount (except the deposit) before 4 weeks of the starting date. 20% of the total amount (except the deposit) between 29 and 15 days before the starting date. No refund shall be granted in the two weeks prior to the start of the course. I LIVE IN SPAIN AND WOULD LIKE TO IMPROVE MY SPANISH, CAN I ATTEND YOUR SCHOOL? Payment is required in advance, minimum 4 lessons in a month . TRAVEL INSURANCE COVERAGE: GBCO Spanish School reccommends all students to have a medical and personal liability insurance coverage. PHOTOGRAPHY AND FILM MATERIAL: By accepting GBCO Spanish School terms and conditions, the student accepts that GBCO Spanish School freely can use this material, that has been created by GBCO’s staff without asking further approval from the student. LIABILITY AND FORCE MAJEURE: GBCO Spanish School will not be liable or responsible for any loss, damage, inconvenience, delay in performance, or failure to perform in connection with the provision of any goods or services due to causes beyond GBCO’s reasonable control, including but not limited to force majeure, fire, natural disaster, acts of government, failure of suppliers or subcontractors, labor disputes or civil unrest, criminal, terrorist or threatened terrorist activities of any kind, public health emergencies, any negligent or willful act or failure to act by any third party, or any other cause beyond the direct control of GBCO Spanish School. These conditions do not affect your rights as defined by the consumer protection laws in your host country. IF MY FLIGHT ARRIVES BEFORE THE STARTING DATE, WHAT OPTIONS HAVE I? You can stay with us and start your Spanish immersion. You only have to reserve the number of nights you need. ARE THE IMMERSION COURSES SUITABLE FOR BEGINNERS? Our experience says yes. We adapt and customize each immersion course for every student and work only with very small groups. This is our advantage, we are always with the students, 24 hours a day. And we become to know better the needs of our students and in consequence we usually know better how to help them. WILL I HAVE SPARE TIME? Yes, absolutely. But only if you want. Our immersion programs are designed to take advantage of your time. Our family and us, the teachers, live together with you, and it is up to you to participate in all the activities that we can organize every day. If you prefer going to the beach, sunbathing or going to visit some place by yourself, we will be more than happy to help and give you all the information you could need. I HAVE SOME ALLERGICS… IS THERE A PROBLEM WITH THE FOOD? Of course not, tell us what is your need and we will try to make tastefull and nice meals every day for you.